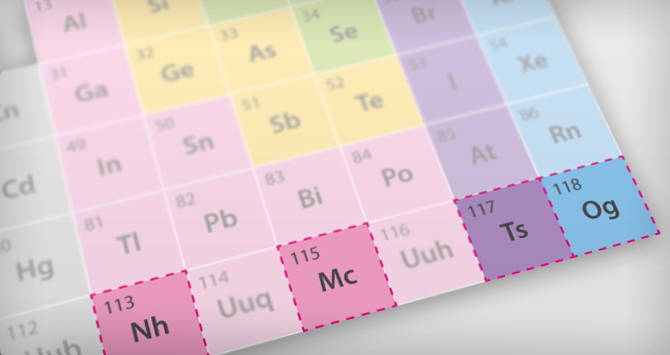 The periodic table of elements has now been expanded by four new additions. The international chemical union IUPAC have now officially consented to the introduction of the elements 113, 115, 117 and 118. Various research teams have succeeded in providing verification of the extremely short-lived atoms in recent years. But why are they looking for them in the first place? The most famous table in science – the Table of Periodic Elements – finished until now with copernicium, the element with the atomic number 112. The atomic number indicates how many protons an atom has in its nucleus. The IUPAC (International Union of Pure and Applied Chemistry) have recently entered four additional elements into the table, thereby also officially recognising their existence. The new elements have 113, 115, 117 and 118 protons, respectively, in their nuclei. Discovery of elements with such high atomic numbers is so complicated because they are extremely unstable and exist for only a fraction of a second. They do not appear in nature. The element 117 was first discovered by Russian research scientists at the Research Centre Dubna in 2010. Scientists at the GSI Helmholtzzentrum für Schwerionenforschung (heavy ion research) in Darmstadt were also successful in substantiating the element in 2014. In order to create it, they bombarded berkelium atomic nuclei (element 97) with calcium atomic nuclei ((Element 20). This generated a fusion process, and a new atomic nucleus – the super heavyweight 117 – saw the light of day, albeit for only a moment. Successful verification of the short-lived element was achieved by the research scientists through measurement of its radioactive decay. This resulted in daughter nuclei that have a significantly longer lifespan and were measured as well. Scientists are attempting to generate heavy and unstable elements in order to learn more about the bonding properties in atomic nuclei. The discovery also serves to put the hypotheses of theoretical nuclear physics to the test. And the findings from these experiments in turn flow back into the theory. A so-called “island of stability” is theoretically conceivable. The more positively-charged protons come together in an atomic nucleus, the more unstable it generally becomes. Nevertheless, it is possible that certain, particularly heavy atomic nuclei return to a stable condition: thus, a constellation within the nucleus that does not allow immediate decay of the element. These elements could possibly then exist for minutes or even considerably longer. This would be a time span that could render practical application within the realm of possibility.